Buildings consume 40% of the U.S. annual energy usage. The energy usage of building can drastically be reduced by proper management of the thermal load in large interior spaces. A well designed space should include systems that balance both occupant comfort and efficiency. Recently linear dispersion ductwork systems have been shown to be a promising solution for creating both comfortable and efficient spaces. We investigate long-term thermal behavior of a 10,000 ft2 building that utilizes a linear air dispersion system. We optimize the operating point of the HVAC system by utilizing three dimensional Computational Fluid Dynamic (CFD) simulations. The long-term air flow, comfort, and energy metrics of the building are analyzed for a number of different flow rates. The steady state simulations consist of 86 million degrees of freedom and resolve physics for length scales that span three orders of magnitude. The simulations utilize High Performance Computing (HPC) and use hundreds of processors to perform the simulations. Finally, challenges associated with the analysis and visualization of the extremely large data sets is discussed. This proceeding is published as Fontanini, Anthony. 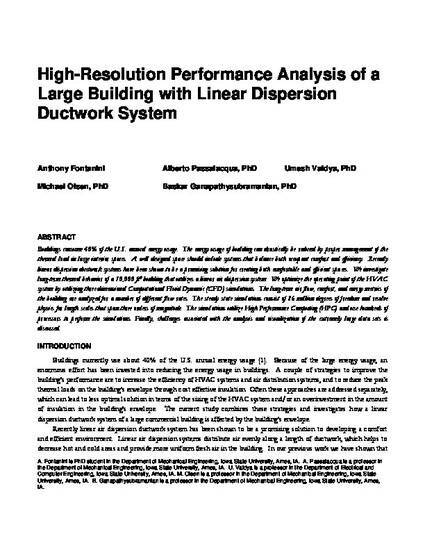 "High-Resolution Performance Analysis of a Large Building with Linear Dispersion Ductwork System." ASHRAE Transactions 120 (2014): S1. Posted with permission.